Green Beans shallow fried with Gram flour . Today's recipe is a bit different from what we make normally,at home .Tried to make it less oily,less spicy and so healthy. You can serve it with plain rice or bread. Green Beans or French Beans are low in calories and packed with nutrients. It is rich in dietary fiber, has excellent levels of Vitamin A. 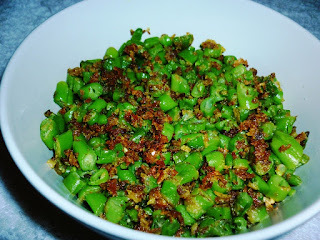 Try to select tender beans .It contains healthy amounts of minerals like iron, calcium, magnesium, manganese, and potassium, which are very essential for body metabolism. This is a simple recipe, which can be made in 5 minutes. Steam the vegetable after adding salt and sprinkling some water until it gets cooked. Now Cool it and then mix in Paprika powder .Now coat this beans with flour and mix well. Shallow fry in 1 tbsp oil. Make sure the flour has cooked well in oil. Finally sprinkle some Chaat Masala if you prefer. Tasty and healthy veg side dish is ready in 5 minutes. A change from normal beans recipes. Trust me it's so tasty ,even without any accompaniments.